Nancy Bryant, owner of Giclée of New England, said her trade allows artists to thrive, not starve. Nancy Bryant snapped her first photo with a digital camera at the start of this decade, and now has become one of the eminent digital artists in the region. Her work has won awards, including one from the International Assoc. of Panoramic Photographers, and also earned her respect from a growing number of artists. However, those artists, as well as several business owners, are increasingly seeking out Bryant to take advantage of the unique venture she incorporated in 2003 — Monson-based Giclée of New England, which is using still-emerging technology to lessen the accuracy of the term ‘starving artist,’ one piece of original artwork at a time. It’s a term that some have trouble pronouncing, but many, especially creatives, hope to learn more about. Giclée (pronounced jee-clay) is an art and photograph reproduction process, which uses digital technology and archival inks, canvas, and papers to create long-lasting, high-quality images. The process borrows its name from the French verb ‘to spray,’ as inks are sprayed onto paper or canvas by specific, commercial-sized digital printers. The archival nature of the prints the process creates (they last for 100 years or more, instead of just a few), as well as the color management it allows, are what make giclée prints unique, and also some of the best reproductions of artwork available for sale, in terms of resemblance to the original and longevity of the print. Giclée has an intriguing history; first developed in the early 1990s, one of its pioneers was Graham Nash, a fine art photographer better known for his musical career with Crosby, Stills, Nash, and Young. His company, Nash Editions, honed the method, and continues to offer it to photographers and artists from around the world. But Bryant’s story is an interesting one, too, and it began with a yearning to make a living as an artist, one since expanded to help others do the same. She graduated from Springfield Technical Community College in 1975 with a degree in graphic arts, and immediately began working in that field, pausing after a few years to start a family. 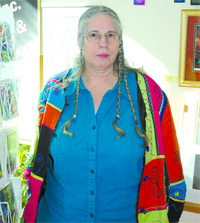 Bryant returned to college in 1988, this time at Westfield State, to complete her bachelor’s degree in fine arts. But upon completing her coursework in 1990, she realized that time and technology had made her previous job as a paste-up artist obsolete. The tide began to turn, but without Bryant truly realizing it, in 2001, when her son bought her a small digital camera as a gift. The possibilities surrounding the new technology intrigued her, even though this was her first foray into the digital age. Still, she stuck to family photos and snapshots until another development pushed her further into the digital art world. Her brother became ill, and when she went to visit him, she brought her new camera and began documenting his final days. These portraits, titled Peter’s Journey, found their way into a local art show, and garnered some praise from other artists. One fan in particular caught Bryant’s attention, though, when he said as beautiful as the portraits were, they would soon fade, because she’d printed them on a standard desktop printer with commonly used inks. “That’s when I realized that image permanence is an issue,” she said, noting that from that point, her immersion in the digital imaging world became nearly all-encompassing. Just months after receiving her first digital camera, she completed a course in PhotoShop, began researching long-lasting printing methods, and, like Graham Nash before her, stumbled upon giclée. Since its start, Giclée of New England has grown each year and is now, says Bryant, a profitable operation doing a little bit better all the time. She owns two of the massive giclée printers needed for the process, and has also expanded her services to include framing and large format printing of banners, posters, and signage (up to 44 x 40 feet). She also handles graphic design; business services including logo, letterhead, brochure, and business card design; image capture (creating a digital version of original artwork and photographs); and offers a sales and shipping service for reproduced artwork, used most frequently by working artists who reproduce their original work and sell prints, often limited edition sets, for additional profit. The business has also grown to include the GoNE Inc. Gallery on Main Street in Monson, which displays a number of both original and giclée prints on a rotating basis. What’s more, the very option of reproducing art is a new one for many artists, and that alone is causing business growth at Giclée of New England as the word spreads. Bryant said that as an artist herself, she also has a certain sensitivity for staying as close to the original creation as possible. In the early days of giclée, she explained, fading was an issue, but today’s inks, printers, and special canvasses and papers have largely negated that problem. Later, there was the issue of metamerism, or the effect of various light sources on a print. Sunlight, for instance, could bring the pinks and reds out, while fluorescent lights cast a yellow or green hue. The newer printers, one of which Bryant owns and uses exclusively for artwork and so-called ‘critical jobs,’ have addressed this problem as well. The older printer at Giclée of New England won’t be put out to pasture, though, says Bryant — it’s perfect for banners and other non-critical orders. But even as technology continues to improve, there is still a very strong human component to quality control at Bryant’s shop. She’s begun to develop a reputation around New England as one of the most accurate fine art reproducers in the region, due to meticulous study of her craft and attention to detail. “I have spent countless hours learning my trade,” she said, noting that it doesn’t begin with feeding a digital file to a printer and pushing ‘start.’ Rather, Bryant must first capture the image, using a scanner mounted vertically on a hydraulic table. She then reproduces the original artwork, often in sections due to size, and readies the art for printing in PhotoShop. The method is called ‘scan and stitch,’ and amounts, in layman’s terms, to just that — piecing the image together to create a seamless product. From that point, the image can be printed, but color correction still falls to Bryant’s eyes on many occasions, as she carefully compares the reproduction to the original. “Sometimes, I get it on the first try. Other times, it can take 50 passes or more to get it right,” she said. Either way, the finished print is close to indistinguishable from its original, and in the GoNE Gallery, Bryant has taken to noting which pieces are original, and which are giclée prints. 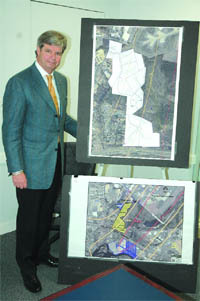 As she moves ahead with the business, Bryant said there are plenty of new plans brewing. She’s currently searching for a new home for the gallery, and is also planning to upgrade some of the equipment that is integral to the shop. This could mean an investment of upwards of $50,000 — equipment includes digital cameras or camera backs, scanners, copy tables, and copy stands — but Bryant said a faster process will also translate into lower prices for her customers. She’s also begun teaching courses, including adult education classes such as ‘how to read your camera manual’ and digital coaching for artists who hope to do some of the work she does on their own. “I want to keep expanding to help artists market their work,” she said. And as she does so, she’s helping the arts community thrive, printing her own creations more than ever, and perhaps giving Graham Nash a run for his money.